Pair of beautiful Electric Blue Budweiser Bud Light pint glasses. Also very good gift for any occasion. New 2017 stunning design - nucleated - CE stamped (M17). Pair of beautiful Electric Blue Budweiser Bud Light pint glasses. Collection available in person from Rushden, Northamptonshire, about 6 minutes way from A45 and/or A6, NN10 area. LIMITED EDITION 2018 WORLD CUP BOXED. BUDWEISER PINT GLASSES x2. WITH LIGHT UP COASTER. 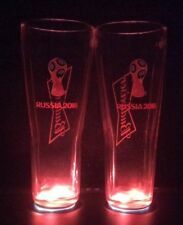 ~~4x LIMITED EDITION BUDWEISER PINT BEER GLASSES RUSSIA 2018 WORLD CUP BOXED!! LIMITED EDITION 2018 WORLD CUP BOXED. BUDWEISER PINT GLASSES x4 pcs. NEW AND UNUSED. Bud light is the lighter version of Budweiser, one of the worlds best known beers. Genuine product. Stylish smooth beer glass shape with the unmistakable "Bud Light" embossed logo. 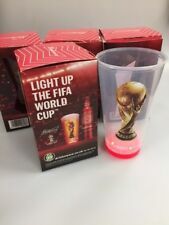 4 x Light up Budweiser World cup collectors cup. Size - Pint 20oz. Quantity - 2 Glasses. A bit about BrewerianaUK. 2 X NEW BUDWEISER PINT GLASSES WITH LOGO. "BUDWEISER" NEW DESIGN,RED BASE, PINT LAGER GLASS 2018 SLIGHT SCRATCHES ON BASE DUE TOO STORAGE. SEE PHOTO NUMBER 4. Size - Pint 20oz. Quantity - 1 Glass. "BUDWEISER" NEW DESIGN WITH RED BASE, PINT LAGER GLASS, IN A. EXCELLENT & SUPERB 2018. "BUDWEISER" LOGO IN WHITE. Budweiser Budvar Pump Handle. Used but in great condition. 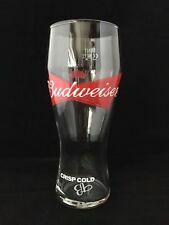 Budweiser Pint Glass Brand New, Still in Box. 18 glasses new, box slightly damaged. 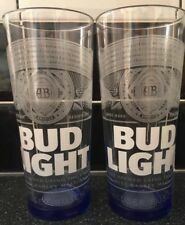 2 x NEW Budweiser Bud Light Pint Glass Blue Base Nucleated. Perfect For A Gift Or A Collection. Condition is New. Other Glasses Are Available Including Bulmers, Estrella, Jamesons, Grants And Glenfiddich. - Please Enquire For More Details. FREE P&P UK SELLER - FAST DELIVERY No Returns. Russia 2018 Football Semi Final World cups Budweiser & Coca Cola Plastic Cups. Condition is New. Dispatched with eBay delivery – Shutl 2-3 days. New Budweiser FA Premier League 2002/3 Season Limited Edition pint Glass with all the clubs badges. LIMITED EDITION 2018 WORLD CUP BOXED. BUDWEISER PINT GLASSES x 2. WITH LIGHT UP COASTER. NEW AND UNUSED. 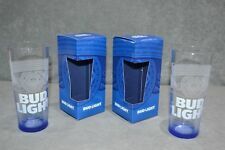 Set of Three Budweiser Bud Light Pint Glasses. Blue Base. Size - 2/3 Pint. Quantity - 1 Glass. Size - Pint. Quantity - 1 Glass. Size - Pint 20oz. Quantity - 1 Glass. A bit about BrewerianaUK. NEW / CE STAMPED / NUCLEATED. BUDWEISER 'WORLD CUP 2018' PINT GLASS (LIMITED EDITION). Genuine Budweiser Red Light pint cup. Cup is 17cm tall, around 10cm across the top and holds one pint of drink. Red light up base (3 LED flashing lights), different patterns of flash. (PROBABLY DEAD BATTERIES). Two (2x) New Budweiser large logo tall pint glasses. Budweiser logo on the front in red and white with 'Crisp Cold' in white near the base. Pint CE on the back of the glasses. Brand new Bud Light pint glass. There's no need to travel all the way to America just to enjoy a glass of Bud light exactly like it should be; in an official Bud light Glass. Enjoy a pint of America's finest lager at home with this tall, elegant pilsner shaped glass, which is printed with a frosty Bud light logo for that super chilled look. To help you pour the perfect pint, this glass is line CE marked at 1 pint, with extra room for a generous head. To help you retain that precious head, the base is nucleated, allowing bubbles to flow faster to keep your pint tasting and looking fresh. Size approx 180mm tall x 80mm wide at top x 57mm wide base. Budweiser Bud Light pint glass. Bud Light logo with information about Budweiser on the front of the glass, with Pint CE on the back. In used condition. STILL INCLUDES REMOVABLE TAB IN THE BASE. THESE WERE A LIMITED EDITION ITEM PRODUCED FOR THE 2018 FIFA WORLD CUP. To quote just a few They are part of my collection which I have decided has to go. Over many years I have collected 2000 glasses and whilst there are a few with which I would never part then they are simply taking up too much space and take too much cleaning. This Officially Branded Budweiser Budvar Pint Tankard, makes for a perfect Branded Pint Glass for the Budweiser lover, most importantly your Budweiser drinking experience seems vastly improved when drinking from an Official Branded Pint Glass. This Pint Tankard is made from Toughened Glass. It is also CE stamped therefore it can be used in Licensed Premises. The front of the Tankard shows the characteristic Budweiser Budvar Logo. This is a heavy Glass They are a great addition to any Establishment; Home Bar; Collection or as perfect gift for the Budweiser Drinker in your life. Budweiser etched on the front and back of the glass. Pint Crown on the side. Budweiser pint glass. Will make a good addition to any collection. 1 x BUDWEISER HALF PINT TANKARD. VINTAGE / CROWN STAMPED / EXCELLENT CONDITION. QUICK DISPATCH IN SECURE PACKAGING. THANKS FOR LOOKING. Item : BUDWEISER BUDVOIR EXPORT - PINT BEER GLASS. Label states : 'Czechoslovakia' indicating glass is pre-1983 when the country was divided into the Czech Republic & Slovakia. Glass unused but box a bit faded.